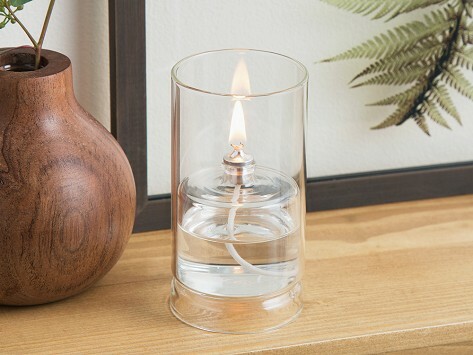 This striking refillable glass oil lamp gets its glow from a paraffin oil alternative. The hurricane-style shield and floating lamp are both made from durable, hand-blown borosilicate glass. Add shells, berries, or greens to put your own spin on this hurricane-style lamp that works indoors or outside. Use with Firefly Fuel’s Lamp Oil for a longer-lasting, cleaner-burning experience that is smoke- and soot-free and odorless, too. Funnel included.